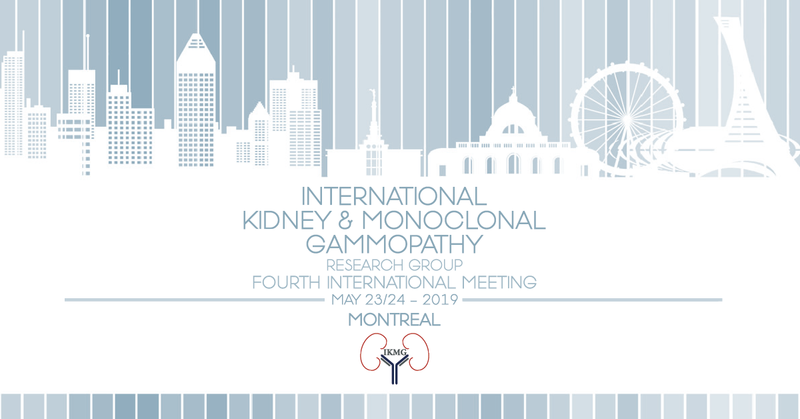 On behalf of the International Kidney and Monoclonal Gammopathy Research Group, we are pleased to invite you to the Fourth International IKMG Meeting to be held on 23-24 May 2019 in Montreal, Canada! Registration is now open for this pre-eminent learning event bringing together the world experts in kidney disease caused by monoclonal proteins. The venue for the meeting is the William Gray Hotel, a wonderful boutique hotel in the heart of Old-Montreal. Plenaries: Updated classification of MGRS-associated kidney diseases, Amyloidosis, PGNMID, Cast nephropathy, Monoclonal Gammopathy of Clinical Significance, …. Abstracts: Oral abstracts session, plus wine and cheese poster session! Of course! Discover the best local food with us at dinner on Thursday night. Add this event to your registration! We are looking forward to welcoming you in Montreal!